Ecoscape conducted a desktop review to identify if the recently endorsed Eucalypt Woodlands of the Western Australian Wheatbelt Threatened Ecological Community occurred within the proposed State Barrier Fence alignment. Ecoscape was engaged by Department of Agriculture and Food Western Australia to conduct a desktop review to identify whether the recently endorsed Eucalypt Woodlands of the Western Australian Wheatbelt Threatened Ecological Community (TEC) occurs within the proposed State Barrier Fence alignment. 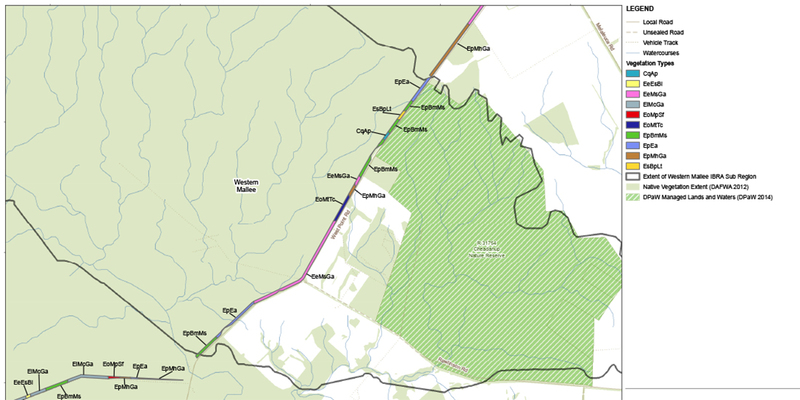 Existing data and mapping was reviewed to identify the species and vegetation types present within a 14.2 km section of the alignment that intersects the potential distribution of this TEC. As none of the key Eucalypt species were present, it was concluded that none of the vegetation types recorded within the section of the alignment that corresponds with potential extent of this TEC, or within 5 km, were considered to represent the ‘Eucalypt Woodlands of the Western Australian Wheatbelt’ TEC.